As expected, heavyweight champion Junior dos Santos (Pictured) will make his first title defense when he meets Alistair Overeem at UFC 146. The 265-pounders will headline the May 26th extravaganza. 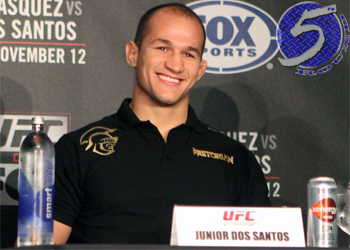 It took the dos Santos all of 64 seconds to put Cain Velasquez to sleep this past November to capture the crown. The Brazilian had his knee operated on shortly after and has been on the mend ever since. Overeem solidified his next dibs status by slapping Brock Lesnar into MMA retirement at UFC 141. The blockbuster bout was “The Demolition Man’s” debut inside the Octagon. MGM Grand Garden Arena in Las Vegas, Nevada hosts the Memorial Day weekend festivities. Tickets for the show go on sale later this month.